[June, 2012] Together with friends I emptied a bottle that I bought for 46,50 Euro in April, 2012. Do not add water to this it falls apart, dramtically, not a good one my score is getting down graded. This whisky was amazingly well made and the bourbon casks used were of exceptional quality. The finish can attest to that. There was also an interesting perfume note that would poke in and out of the nose and taste. A great whisky that's well worth trying. Initially, soft fruits, complex vanilla pod, banana cream pie, and straw. After 5 minutes in the glass, honey, and soft baking spices. Soft vanilla that builds in complexity with time, soft fruits, and orange zest. White fruits on the nose of pear and melon, wood varnish cleaning fluid but its pleasant definitely. The bitterness is really noticeable at first but then there is a little toffee and again some pear but now with a little lemon. 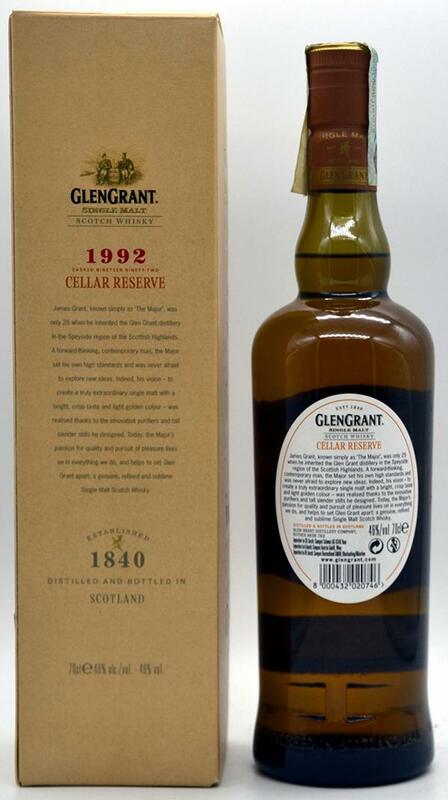 Glen Grant 1992/2008 'Cellar Reserve' (46%, OB) Colour: straw. Nose: the fruits are back! Even more pears than in the official 10, to the point where it smells almost like pure Poire Williams. Then we have a little wood smoke, even hints of bacon, and finally some beautiful whiffs of chamomile and lime teas. No, wait, there are also whiffs of barnyard after the rain… Like sipping some pear spirit in a farm; back to nature! Mouth: pretty much the same, a lot of pear (and the spirit made thereof), a little salt, something kippery that you wouldn’t expect in Glen Grant and notes of bitter herbs liqueur (starting with J…). Full-bodied and with quite some character. Finish: the longest of the three. Pear pie with salted liquorice. Comments: once again, a very ‘natural’ malt whisky with an excellent body. The pear on the nose is spectacular and it’s not the kind of dull pearish notes that one may find in immature whiskies. SGP:541 - 84 points. Cork Broke, always keep spare corks! 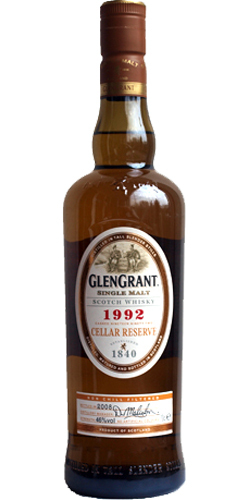 Nose: sweet flowery, vanilla, clearly nice balanced medium aged bourbon barrel Glen Grant. Taste: Fruit and classic sweet and sour. Some savoury note too. Oak shavings and heather. Finish: medium. Same as taste, but more honey and caramel. Presentation: Fairly, not much of the marketing blablabla. good result, great about strength (46%). Fresh and fruity, very drinkable. 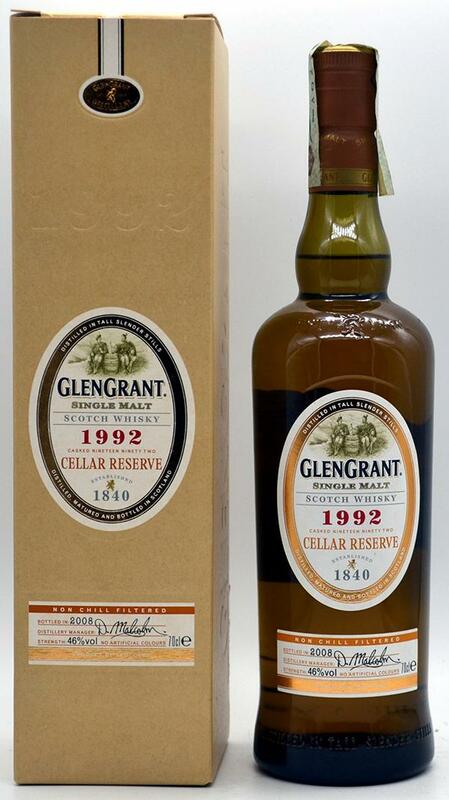 Bit more complex to other Glen Grant of the same age from the distillery. Interesting what more age could do for this one. Some wood and spice would add some more kick. Fresh, citrus, bit floral with lots of honey. Violets with greent tea and mint. Very fruity, ripe pears, green apples, honey and green tea. Nice hints of fresh cut grass. sweet and fresh, yet too short.